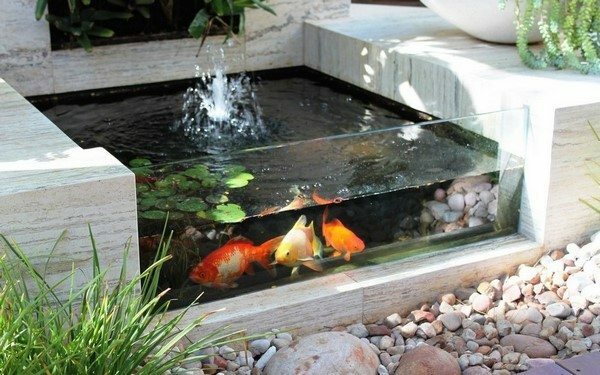 Koi pond design is becoming more and more popular among the variety of artificial water reservoirs. 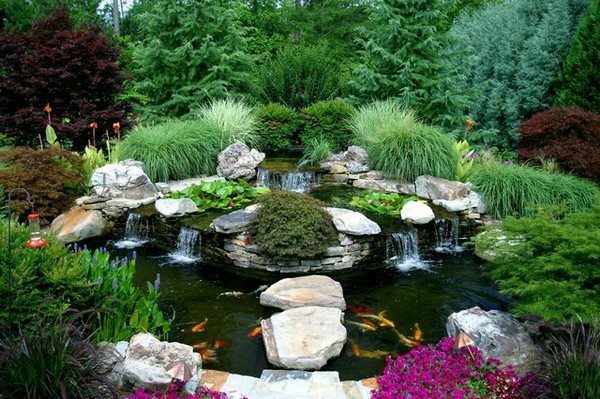 This is one of the most attractive garden ponds with a great decorative value. 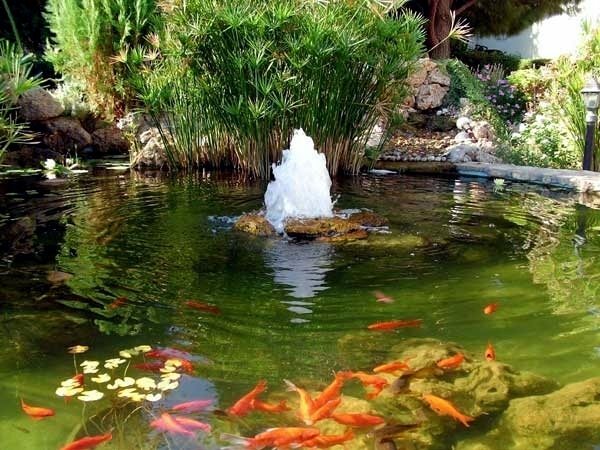 As the name suggests, the pond differs from other artificial ponds as it is populated with carp fish. The grace, solid size and beautiful colors of these fish are truly amazing. 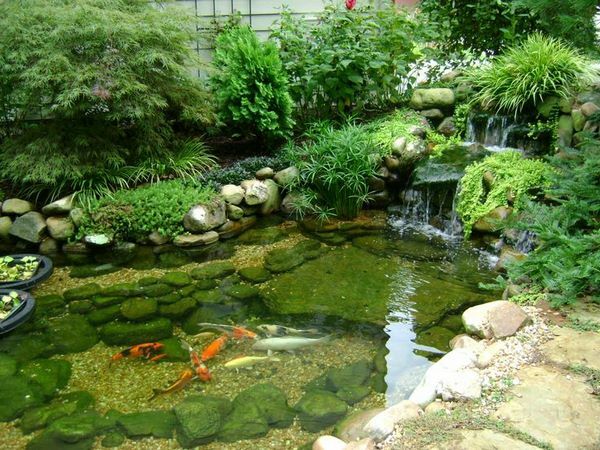 What many homeowners do not realize is that a koi pond is actually a mini eco-system and if you consider the construction of such a water basin in your garden or backyard, you need to follow certain rules and provide a suitable environment for your fish to thrive. 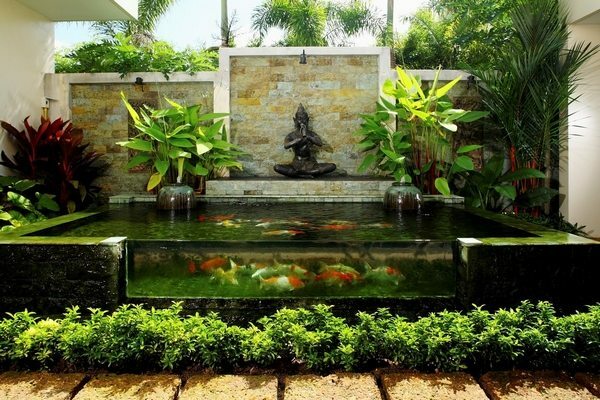 We shall look at the basic rules and the fundamentals of the design and the most important elements of your garden pond and will give you some tips how to arrange a most spectacular and safe koi pond. 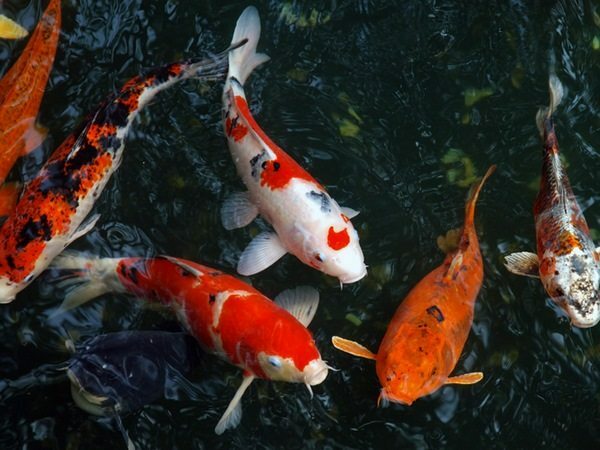 Koi – the Japanese colorful carps – are the most popular inhabitants of small artificial reservoirs all over the world, whether it is Asia, Europe or America. 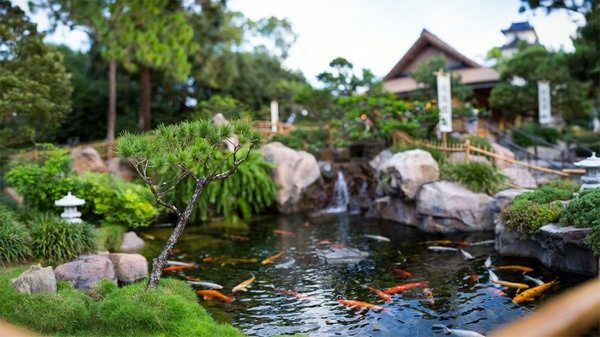 Contrary to popular belief, the fish first appeared in China and was cooked like ordinary fish but Japanese people thought that koi are too beautiful to consume them as food so they started the tradition of contemplating a pond in which bright fish float. Unique in color variations Japanese carp, or koi, are known to mankind for more than two centuries. Large, half-meter (individual specimens reach a length of more than a meter), fish are unpretentious, they quickly get used to the person, to the conditions of the habitat and the feeding regime. In Japan the attitude towards carp is exceptionally respectful. The carp is a symbol of well-being, masculinity, persistence and perseverance. 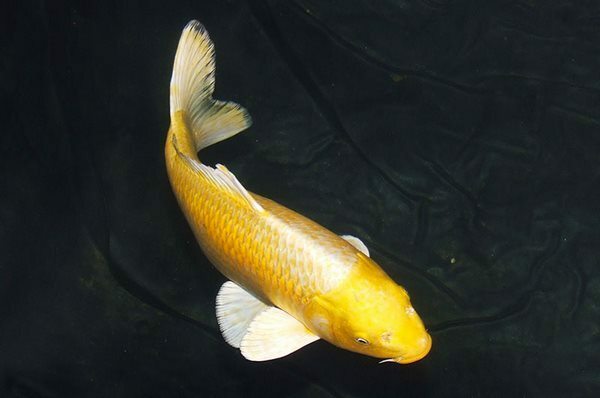 The koi fish is a part of the carp family, and today one of the most popular fish species for the garden. Since they are offered in a variety of strong colors, they are often victims of birds but if you ensure a good protection, they can become your new favorite pets – they are ready to eat from your hands. 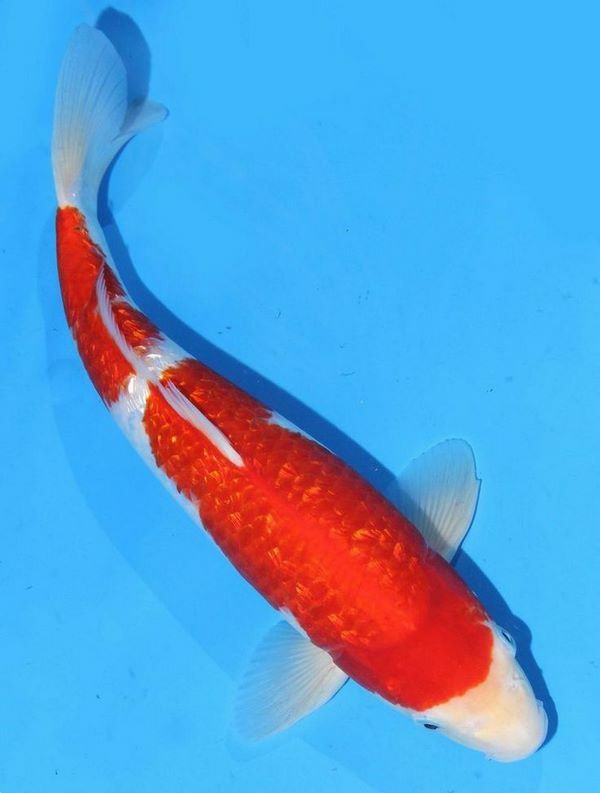 Koi are mobile and “sociable”, like to eat, they are curious and affectionate and enjoy company. They will swim to the surface of the water if a person approaches it and will even follow a man along the shore. Carps reach maturity after two to four years and can be considered long-livers among animals – half a century old for them is not uncommon and not considered as old age. Each animal is individually colored (the color of fish depends on the breed) and as a rule, white and red colors prevail, but blue, black, yellow, orange or gold and green spots are a major feature of the breed. Some breeds cost thousands of dollars but the more ordinary ones are quite affordable. They are insatiable and often eat aquatic plants like water lilies growing in the pond. 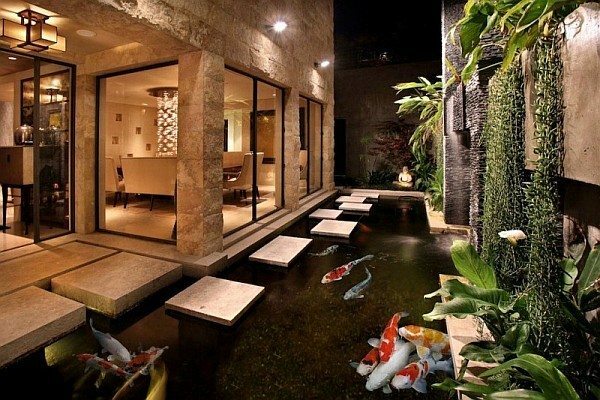 Koi will feel good and live in open artificial reservoirs all year round. They can exist at low temperatures, but they are very demanding on the purity of water. 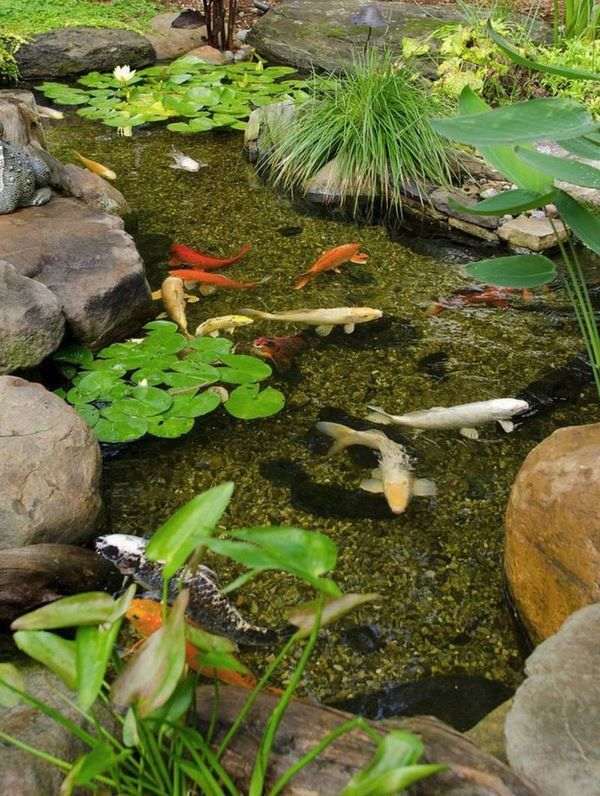 In addition, space is important for them and if your pond is crowded, individuals will develop slowly and their color will not be as bright as you expect. Wintering should be in a place not subject to freezing. You can feed carps with fruits, vegetables, barley, worms, insects, etc. 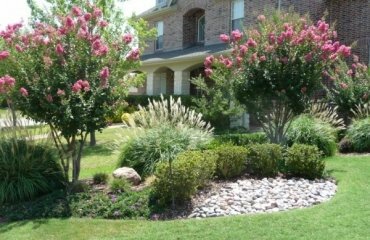 Correctly and aesthetically designed pond, inhabited by aquatic flora and fauna, creates a special atmosphere and adds tons of style to your landscape. 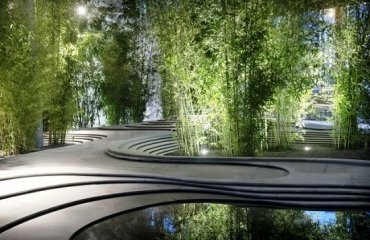 We have to be honest, however, the construction of a pond is a rather expensive and time-consuming project suitable for people who are ready to the task, and then care for the fish. 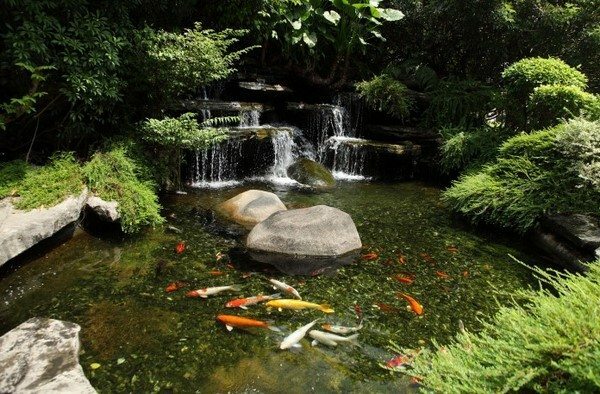 As we mentioned earlier there are several fundamental features of a koi pond design – Filtration, Aeration, Water quality, Rocks and gravel, Fish, Aquatic plants – all of these have to create a balanced eco-system. Pond filtration (pond filter) is a must as it will keep the pond clear. Due to the great appetite of carp fish they produce a large amount of waste. Accordingly, the quality of water decreases: algae appear and high-quality filtration will destroy bacteria, algae and biological waste. There are two main types of filters – mechanical and biological. Mechanical filters – skimmers, pump baskets, etc. – are responsible for the debris and waste while biological filters convert toxins into harmless substances. 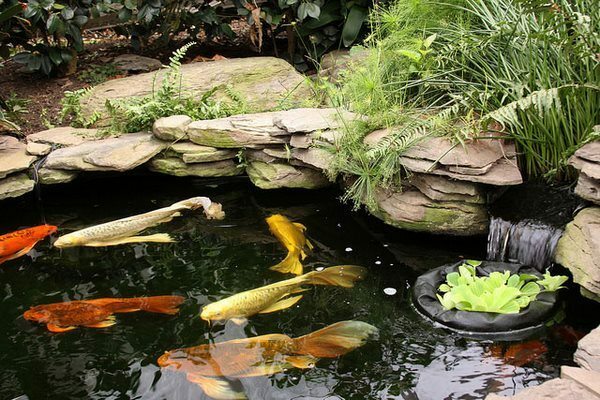 Aeration and water quality are essential for your koi pond. Make sure that oxygen levels are sufficient for the number of fish, the amount of plants, etc. 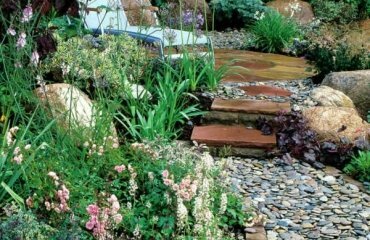 Many homeowners choose a waterfall or a fountain as an additional water feature which aerates the pond. This is a very natural way of oxygen circulation in the water. 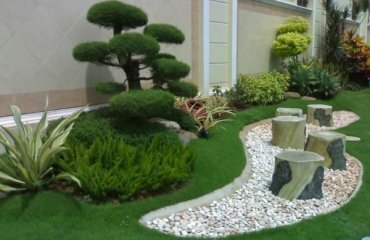 However, if the size of the pond does not allow such a feature, you can take advantage of special aeration pumps. 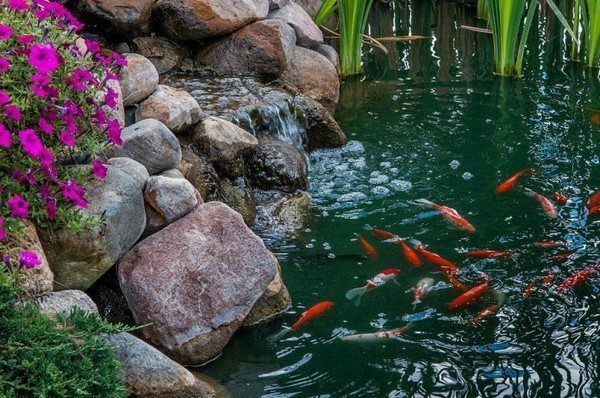 As much as aeration and filtration are important for the well-being of your pond, water quality is another major factor which can have an impact on the fish. Water temperature, pH levels, chlorine levels – these are the most important parameters that you need to monitor. Remember that chlorine is harmful to Koi so buying a de-chlorinator is a good investment. As far as temperature is concerned – the ideal one is 39° to 68° F and the best pH level for a koi pond is between 7.0 and 7.8. Depth – any open water body with a minimum depth of 1.3 m and a surface area of 5 square meters is sufficient to accommodate half a dozen fish. 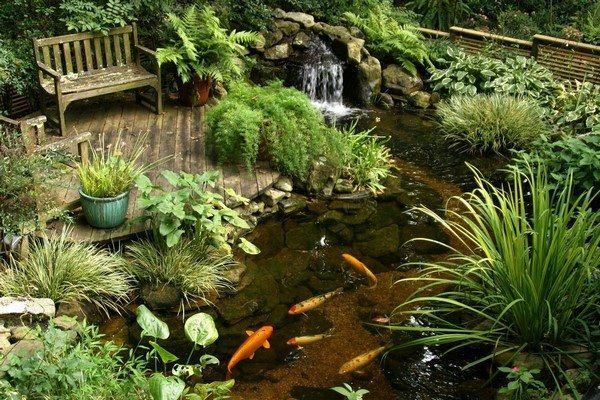 However, koi love space, and any increase in the size of the pond will have a beneficial effect on the size and weight of the inhabitants. 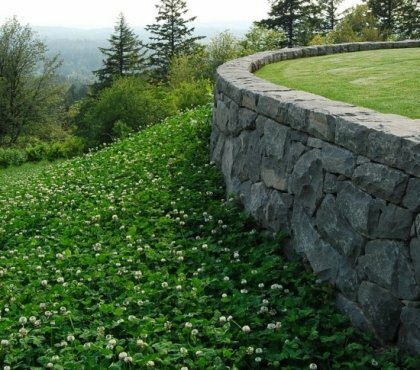 The general rule for calculating the volume of the future pond is one carp – 1000 liters of water. 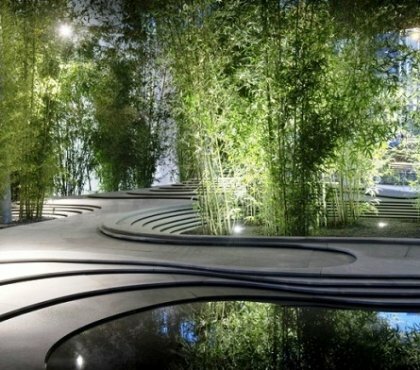 Another option is to make a pond 7-8 m long, 4 m wide and 2 m deep. According to breeders’ estimates, these sizes are enough for 15-20 adults. At the same time, the pond does not look crowded. Of course, the figures are approximate, because the reservoir may not be an ideal rectangle. The deeper and more spacious the pond, the better the koi fish will feel. They will grow faster and their color will be brighter. 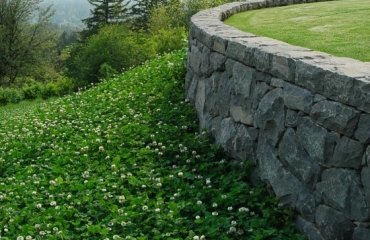 One of the most important considerations that you need to keep in mind with regard to the depth of a Koi pond is to provide favorable conditions during the winter period. The fact is that carp need to winter somewhere. 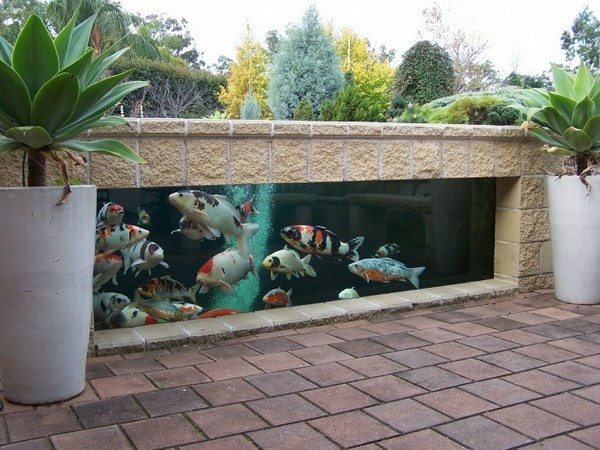 You could transfer the fish in an aquarium inside your house but just imagine how large an aquarium should be! Make sure that you provide a pit where the fish will not freeze. Bottom level is also important since koi fish love to dig in the bottom sediments in search of food. 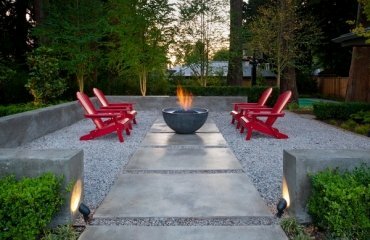 Therefore, a decorative koi pond should be covered with pebbles or gravel. Aquatic plants must be chosen taking into account that koi is omnivorous – either fast-growing species or species that carp cannot eat. 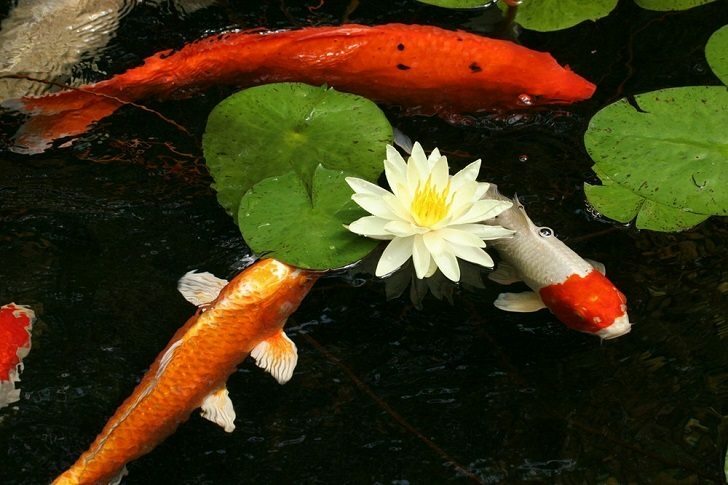 When feeding koi it will be good to follow a simple rule – often and little by little. It is best to use floating food and in this case koi fish rising to the surface and taking food directly from the hands, turns into a spectacular beauty. In addition, it allows the timely removal of surplus food, preventing decomposition. Ornamental Koi fish come in many varieties and here are some of the most popular ones that you can breed in your garden pond. Kohaku has a white body with red patterns on top of the white. 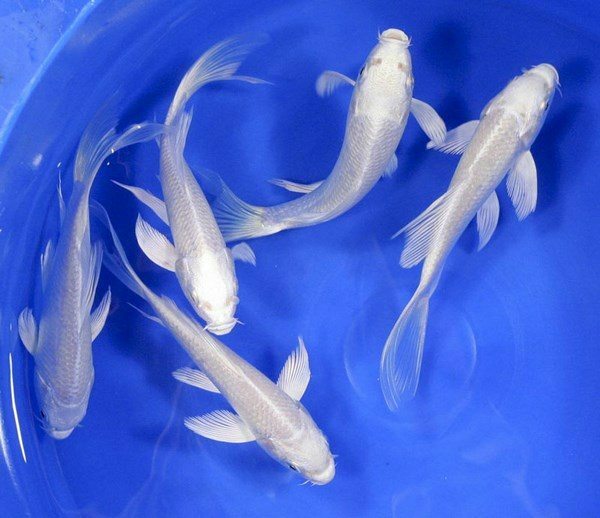 This is one of the most well known koi species and comes in several varieties – Doitsu Kohaku, Gin Rin Kohaku, Maruten Kohaku, etc. 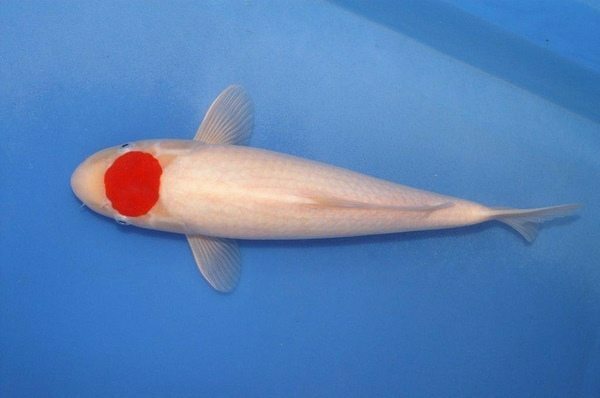 Tancho Koi is the most popular variation of Kohaku with a single red dot on the head of a purely white fish. Variations of Tancho include Gin Rin Tancho and Doitsu Tancho but it is the placement and the symmetry of the red dot that determine the quality of each individual fish. Platinum Ogon, also called Purachina Ogon are simply amazing – they have a solid, metallic-white color, and purely white head. Variations include Gin Rin Platinum Ogon and Doitsu Platinum Ogon. Yamabuki Ogon are instantly recognized for the metallic yellow color. The variations include Gin Rin Yamabuki Ogon and Doitsu Yamabuki Ogon. Koi varieties also include Taisho Sanke, Showa Sanshoku, Shiro Utsuri, Asagi, Matsuba, Kikusui, Chagoi, Kikokuryu, etc and it depends on the personal preferences of everyone which particular varieties will inhabit his pond.